2010 was Miss Daisy’s most successful year ever. At both the New York City and Philadelphia Regionals, Miss Daisy came out on top as #1 seed and later went on to win both regionals! 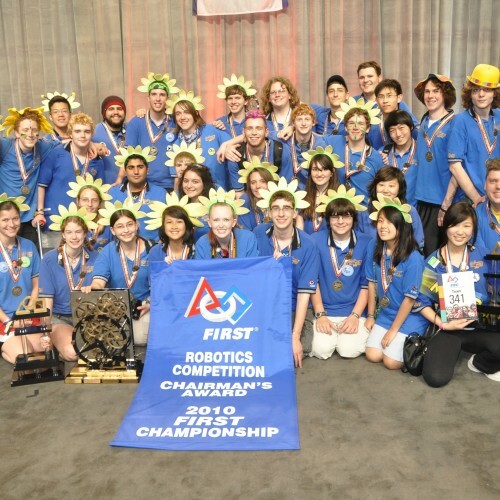 Its hard to top two regional wins but Miss Daisy and her crew went on to the Championships with high hopes and came home with highest honor in FIRST®: the Championship Chairman’s Award. No words can describe the joy our team felt when this award was announced – it truly was a once-in-a-lifetime experience. The Daisy team now has so many new plans for our future and can’t wait to help even more FIRST® teams in the years to come! Philadelphia Regional Dean’s List Award: Evan O.
BREAKAWAY™ is played on a 27-by-54 foot rectangular field. There are two bumps to divide the field into three sections and a white line that divides the field down the middle. Two towers stand at the intersections of the bumps and the white lines. Two alliances of three robots, try to kick soccer balls into their alliance’s goals. At the end of each match, the robots are encouraged to hang from the towers. 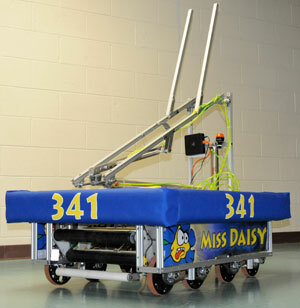 In order to receive points, a robot hanging must be at least 18 inches off the ground. Any robot suspended from another robot hanging to the tower will receive extra points. For every ball scored in an alliance’s goal, that alliance will receive one point. For every robot suspended more than 18 inches off the ground, their alliance will receive two points, and alliances will attain three points for every robot hanging off another robot.